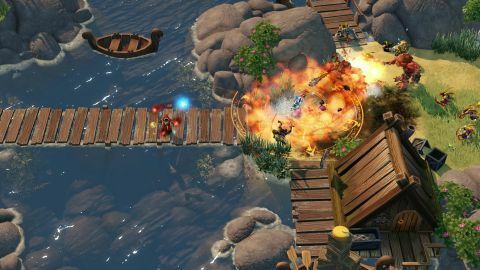 A leaner, smarter take on Magickas fascinating combat system, Magicka 2 is the co-op adventure youve been waiting for. I’m in full flight away from an angry, sword-wielding elf when I trod on an explosive mine planted by my wizard friend. “Whoops,” he says. “Sorry.” Fireball. Ice spike. Snow storm with lightning behind it. In Magicka 2, there are many ways for your friends to kill you instead of the guy they were aiming at, but hey, that’s part of the charm. Paradox knows that die-hard fans of 2011’s Magicka just want more of the same (they said as much during press events last year), and for the most part that’s exactly what Magicka 2 is. If you loved Magicka and can’t wait for more, here is a one-paragraph review for you: Magicka 2 is faster, slimmed-down, and just as brutal. Changes to the spell system rob the advanced spells of their most potent powers, but makes them easier to wield. It is absolutely unplayable as a single-player game, but two friends can blow through the main story in an afternoon. Now get out of here and go play it. If you’ve never played Magicka, you’re missing out on an irreverent, slapstick wizard adventure grafted onto one of the most fun combat systems ever devised. Viewed from a top-down perspective, players control wizards by joining any five of eight elements and casting them (via the QWERASDF keys) on others, themselves, their swords, or on the ground around them. Taking these eight variables and multiplying them by four ways to cast them yields tens of thousands spell combinations, each with its own effect. Shield and rock cast together can create a slab wall between you and your enemies or a suit of rocky armor, depending on circumstances. Add fire and rock to throw a fireball. Mix frost, water, and death magic to shoot a spray of poisoned ice shards. It goes on and on, and the magic of the system is that experimentation is the only way to discover great combinations. Magicka 2’s humor is a wry, winking smirk—it could be described as National Lampoon’s Middle-Earth Vacation. Every character speaks heavily accented nonsense behind subtitles. During one climactic speech, a bad guy towers over your party and intones “hurpty durpty no-no funsie wally boom-boom.” Everything from Magicka 1’s own glitchy launch to the quiet desperation of Papers, Please finds a grinning recreation in Magicka 2 with all the subtlety of a lightning bolt to the face. Returning to combat: In addition to the eight elements, Magicka 1 included a vast array of special spells of immense power. At any time, casting steam and lightning created spicy electricity. But casting it in the right order and pressing space bar summoned a thunderclap capable of disintegrating any enemy. Magicka 2’s biggest change is to strip down these dozens of special spells to a few essentials and assign them to a cooldown hotbar. Hey, speaking of difficulty, don’t even bother with Magicka 2 if you don’t have friends to play with. Without a friend to resurrect you, you’re forced into a defensive playstyle that the level design deliberately disrupts. Playing alone also keeps you from crossing beams and chaining explosions with friends, so the most powerful spells aren’t accessible to the lonely wizard. Just as with Magicka 1, eventually you’ll solo your way to some brutal level boss and beat your head against it until you quit. With friends, the freewheeling, aggressive style Magicka is known for shines through. Any good boss fight saw my party resurrect itself many, many times, accepting casualties as the cost of doing wizardly business. Without having to constantly start over from checkpoints, I beat the main campaign on normal in less than four hours. That’s pretty short, but considering Magicka 1’s overlong slog of a campaign and the multiple ways to replay levels in challenge mode, and Magicka 2 offers a ton of replayability in a tight, economical package. Plus, it’s launching with a starting price of $15, so I have a hard time complaining about campaign length here. Beyond stability, Magicka 2’s PC version is pretty basic. Magicka was so infamous for a shoddy launch that it eventually added a new spell: Crash to Desktop. Magicka 2, thankfully, is stable as a rock. I noticed the odd animation glitch here and there, but my party and I never had problems with dropped connections or lag. Beyond stability, though, Magicka 2’s PC version is pretty basic. There’s no way to rebind keys, and in-game button prompts all feature PlayStation 4 control schemes—practically scandalous for a celebrated PC publisher like Paradox. Paradox set out to deliver more of what fans loved about Magicka 1, and I think they’ve done it. Aside from a more stable release and simplified power-spell system, Magicka 2 is Magicka 1 done over again, in a more polished, streamlined, bite-size package. For a bargain like $15, Magicka 2 provided me with several days of shrieking, giggling, screaming-at-my-friends fun. It throws enough new ideas into the mix—one boss battle turns into a magical game of rugby with explosions—to stay perpetually surprising. If you missed Magicka 1, Magicka 2 is an appealing entry point to the series for fireball-flinging friends.